1. Are you better working in a team or working alone? 2. Do you have any situations in the past where you have some arguments with your team members? 3. What do you like about a Manager? And what don’t you like? 4. Where do you see yourself in another 5 years? 5. 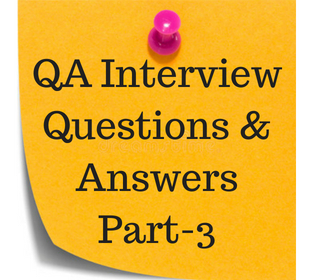 Why are you in QA? 6. Why do you like this job? 7. How do you determine what to test in an application? 8. If you have no documentation about the product, how do you test an application? Describe the process. Answer: Well, this is a situation where I have come across several times. Some of the companies in my previous projects did not have any documents. In this case, I went to the Business Analyst and sometimes to developers to find out how exactly the functionalities work, how to navigate from one page to another page and so on. After getting a clear vision, I write test cases based on the conversation (which is a step by step procedure to test an application) and get ready for testing. 9. What do you do once you find a defect? Recreate the Defect: Once you find a defect, we must try to recreate (meaning that we should be able to reproduce it) at least 3 times so that we are sure that it is a defect. Sometimes, once we find it log it without recreating, may put us in a false situation (because sometimes the application does not behave in the same way). Therefore, it is important to recreate the same defect several times. Attach the Screen Shot (supporting document): Once we confirm that it is a defect, and then it is a good idea to attach supporting documents when we log (write) a defect. For example, screen shot, requirement document etc. For instance, let us say that instead of “Continue” button on a page, there is a typo “Contiinuee”. Now, we will make a screen shot of this page (To make screen shot, press “Print Screen” button on the keyboard, and open a Word document, and Click Edit on the Word document and “Past” it. You will see the screen now) Now, a tester needs to write defects in easy and clear language to make all the developers to understand easily. Log the Defect: Now, the next step is, we need to log it. Depending on the company what kind of tools they are using (for example, some companies use TestDirector to log defects, some companies use Rational ClearQuest, some use PVC Tracker and so on). If the company is small and cannot afford these expensive tools, then they may simply use Excel sheet to log defects. We log the defect. What are the basic elements you put in a defect? 10. What is the biggest bug you have ever found? 11. How do you make sure that it is quality software? 12. As a QA Tester, can you tell me the situation when you felt the most proud of it? 13. What made you to choose testing career? 14. When should testing start in a project? Why? 15. Let us say you have a web application to test. How do you go about testing it? What is the process?